I know nothing about the US Army or the validity of the HBR analysis, but the fading of accountability seems to extend far beyond this military example. Coaches and counselors are among those who seek to build accountability into their work but a culture of entitlement and a fascination with tolerance can undermine accountability and eat away standards in different parts of a culture. Teachers see this repeatedly in students who expect an A regardless of the quality of their course work. In addition to academia, hasn’t this permeated the theological and church worlds where many Christians live no differently than anyone else but prefer “feel-good” songs and messages rather than any calls to commitment? The HBR article is strong on analysis but weaker on providing solutions. Maybe the solution starts with individuals. I confess my tendency to give mostly A grades, even for poor work, because this avoids the student complaints. But this doesn’t help students or maintain academic excellence. Wherever we work we can build quality and instill accountability even as we maintain sensitivity, grace and respect for others. Does any of this have relevance for you? Please comment. Next Post → Newsletter #502 – Do You Still Have Time to Change the World? Somehow our society lost the idea of achievement. I heard of a situation in youth soccer where the winners scored many more goals than the other team. The game was ended because of a “mercy” rule, and the losing team received some sort of award. Clearly, the conditioning is that “winning,” or achievement, is not to be strived for. I guess entitlement rules in many ways. I especially see this in higher education where grades are so important. Though I have coached Kingdom workers in “developing’ counties and taught others to do the same, I have never made it work in North America. I have a theory; perhaps a testable one? a) Status. Coaches have authority and apprentices have opportunity. b) Reward: Coaches prove generous and apprentices have needs. c) Cohesion: Coaches empower workers to succeed, and apprentices have families (or churches) with expectations to be met. In North America, leaders may have power (cohesion) but little authority; leaders profit from workers who show little loyalty; and individuals remain ‘atomized’ or independent of traditional social units. Perhaps the looming economic collapse and resulting social conflicts will drive survivors into little communities wherein coaching will, once again, arise through willing accountability? Thanks for another thought-provoking posting, Galen. I think that the people who do and teach coaching would argue that coaches seek to not have status or give rewards – but I have several disagreements with the core values of coaching (including the idea that coaches are non-0directive. I think there is research to show that being non-directive is impossible. Even Carl Rogers eventually agreed and used the words “client-centered.”) You are right, there are some research possibilities hee. My kids are in high school and play club soccer. On one occasion, my daughter’s team was winning by 5-0 and suddenly they seemed to start missing shots when clearly they could have scored. We could not understand what was doing on. After the game we asked her why they missed so many shots and her reply was “Penguin”. She explained that the coach had told them that Penguin means they keep playing passing the ball and practice on moves, but not to score. If they are winning, why score and to be merciful to the other team. I was somewhat upset at the idea. I understand about being merciful, but when it’s a competition event, the players signed up to be pushed to their full potential.I myself would have felt humiliated knowing the other team was not giving their all because my team was loosing by a big difference. How are they to learn and mature when this type of ideology is taught. Where is accountability for the other team (practices, listening to coach, coaching practices, etc.)? Where is this leading our children in the future? Will they be expecting others to ALWAYS show mercy when when they have not kept/done their part in school, work or relationships, especially with God. Yes, God is a merciful God, but he is also just and righteous. Are we not going to have consequences when we have sinned? Yes we are but, He is merciful to be there with us as we go through the consequences. It seems that standards and accountability are continually being lowered for humanity. One sports clothing commercial says,”Just do it!”, but then on the fields they are taught “Penguin”. Elda. This is an incredible story. Thanks for sharing it. I especially appreciate your observations that Penguins has implications far beyond soccer. When there is no accountability there is no progress or increase in quality. Of course we have all seen the “Dummies” books. I wonder if there is significance that the dumbing idea started in America. And you are right – this has some interesting theological implications. Holding other accountable requires a boldness within oneself to be true to truth, rather than the expectations of others ( which could be society as a whole). I believe we all long to have others hold us accountable to show they care. But only when it is done with love. Thus Accountability ties the two greatest commands from God together, Truth and Love, when put into practice properly. It is my big “working on” this year, in essence to be bold enough to be live out well God;s truth to impact the lives of others for eternity. My newsletter on accountability did not generate much response but I suspect some of us have thought a lot about that. 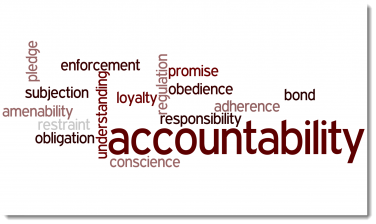 I am glad accountability is such an important part of coaching and mentoring. OK Ken. Nows you have revealed that I am your coach. It is not my job to leave you alone (as you have discovered). For others who might read this I told Ken that if he does not complete the book that is one subject of our coaching, then there is no Christmas. Here is the slogan: “No book, No Christmas.” Is that accountability or coaching abuse?? ?